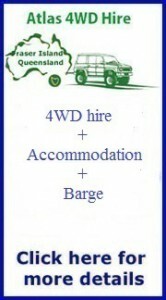 All prices are a per day rate and include 200kms free per day. Bond reduction to $2500 is available at $60 per day. One day hire is a calender day not 24 hours. i.e. pick up in the morning, drop off in the evening. Based in Hervey Bay, we are the closest to River Heads – Fraser Island Barge departure point. Please note: There is a compulsory safety talk to all drivers before the start of any 4×4 hire. Please allow 1 – 1.5 hours for this.